Here we present a consensus position of the membership of the Bio-Process Systems Alliance (BPSA), the trade organization for the single-use industry based in Washington, DC. BPSA’s membership includes 48 corporate and institutional entities, among them component suppliers, systems integrators, end users, and independent testing laboratories. Consensus within this membership is reached through an official ballot of representative voting members, as provided for in the organization’s by-laws. The position outlined below was approved by such an internal consensus-balloting process. Single-use systems (SUS) have found broad acceptance in pharmaceutical manufacturing based on their operational and economic benefits. To expedite selection and implementation of such systems, industry-wide discussions have been ongoing for several years with the goal of aligning basic qualification requirements. In particular, the development of consensus thinking on extractables testing for components and systems has been active for the past two years, along with the pursuit of a consensus standard for extraction and analytical methodologies. Two organizations — the BioPhorum Operations Group (BPOG) and BPSA — are leaders focused on material safety aspects of single-use systems. Discussions have ensued between the two groups — and including others such as the American Society for Testing and Materials (ASTM) and the American Society of Mechanical Engineers’ Bioprocessing Equipment group (ASME-BPE) —on technical topics such as sample preparation and solvent exposure conditions; identification of model solvents, study time points and temperatures, and analytical techniques; definitions of test articles; and expectations for implementation. Recently, a paper written by representatives of the BPOG Extractables Working Group was published as a proposal for standardized testing to be performed by single-use component suppliers and/ or integrators (1). BPSA recognizes this paper as a valuable stimulus to the single-use technology industry from a group of end users. BPSA also recognizes that opinions differ among subject-matter experts within BPOG member and nonmember end-user companies, suppliers, and independent testing laboratories, as well as official standards-writing bodies. Those differences must be resolved before a full industry consensus standard can be established. BPSA wishes for discussions to continue to evolve both in content and in their collaborative, consensus-building spirit. Our intent is to state our view on the benefits of adopting a true industry consensus on extractables testing of single-use systems. We also identify current hindrances to our common goal and propose next steps the industry may take to move toward full consensus agreement. This discussion is based on BPSA’s mission to foster the adoption of SUS in the bioprocessing industry, to which our commitment remains fully intact. It is clear that, at this point for the SUS industry, a consensus on component extractables protocol(s) has not been reached. Some technical, scientific, and commercial issues remain among small and medium-sized entity (SME) stakeholders. BPSA believes that a standardized approach to conducting and reporting on extractables studies will assist all vested parties involved: suppliers, end users, regulators, expert consultants, and testing laboratories. Suppliers and expert consultants will know what end users and regulators expect and have confidence that their data sets will be of suitable quality and technical rigor for use in patient-safety risk assessments. Meanwhile, end-users also will know what to expect. They will benefit from both an increase in the amount and quality of data and reduced funding for additional extractables studies that would otherwise be needed to bridge gaps in supplier data. Integrator supplier companies — which purchase components and create assemblies —also will benefit in largely the same ways. Regulators and end users both will benefit from current industry thinking on the subject and from a resulting simplification of extractables submission reviews. With the ultimate adoption of a standardized approach, component suppliers would be generators of study data. That would lessen the proliferation of multiple (potentially conflicting) data sets to support each component. It would also lessen the overall industry’s spending on characterization of those components. A sufficient body of well-executed and well-documented data that — properly evaluated in a process- and product-specific way as part of risk management — can be used directly in regulatory submissions. That will provide great benefits overall. Despite substantial collective industry-wide efforts, no true consensus has been achieved. From the BPSA perspective, the SUS industry has not yet come to an agreement on the details of a standard extractables study protocol for many reasons: e.g., lack of alignment on fundamentals, accessibility to data, and clarity of regulatory opinions. Few groups active in this area have consensus on such fundamental items as the definition of extractable (Table 1) or the objective of an extractables study. Furthermore, public-domain data are lacking that could otherwise drive decisions on some of the detailed technical attributes of a consensus standard protocol. During many discussions, stakeholders have demonstrated uncertainty about how such a standard would be adopted and what expectations would ensue between suppliers and end users. 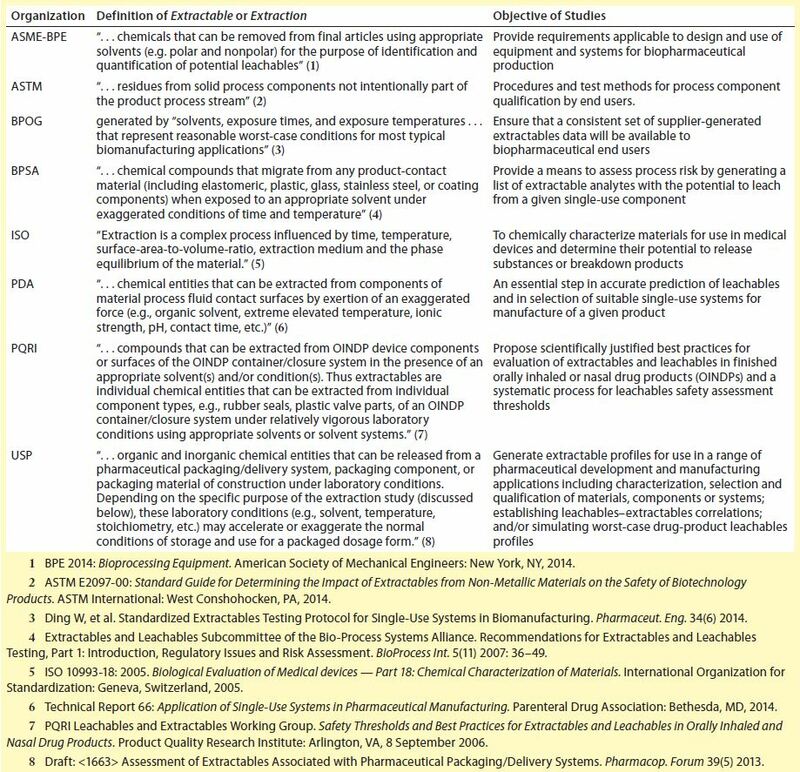 Additional concern relates to the possibility that different standard-development organizations (e.g., ASTM and ASME-BPE) and compendial bodies (e.g., USP) could publish conflicting standards/ monographs. Thus, implementation would be more efficient not only with alignment of various organizations for SUS, but also with leveraging of extractables standards for drug-product containers and closures. Some end users and suppliers have been concerned that a specific consensus extractables standard developed for biopharmaceuticals overall may not meet the needs of other sectors, such as vaccines and classical small-molecule pharmaceutical products. That could create an environment for competing standards. At this time, global regulatory bodies disagree on the ability of proposed standards to deliver on the objective of reducing complexity of the extractables evaluation process while maintaining patient safety. In the end, of course, a standard will be best if it is readily accepted by regulatory agencies. In its CGMP guidance for the pharmaceutical industry, the US Food and Drug Administration (FDA) encourages a science-based, risk-assessment approach overall for process validation. Process understanding and prior knowledge are essential ingredients to meeting regulatory requirements. By applying the existing body of knowledge and guidances at the time (where appropriate) to disposable bioprocessing materials, BPSA published a two-part article in BioProcess International’s December 2007 and January 2008 issues (3, 4). They were the first SUS industry publications highlighting a step-wise and risk-based extractables study approach for single-use bioprocessing systems. Both documents were presented to the FDA during a one-day symposium on 7 March 2008 that was broadcast to several locations of the Center for Drug Evaluation and Research (CDER) and the Center for Biologics Evaluation and Research (CBER) and subsequently used for internal training. Regulatory representatives in attendance recognized this step-wise and risk-based extractables evaluation process as an acceptable approach. To date, that approach has been used to successfully evaluate the material safety of single-use processing systems for many approved drug products. Evaluating supplier data and/or generating test data is a key step in the extractables evaluation process flow chart from Part 2 (4). A call to action from end users for suppliers to align their input to that step was expected and initially occurred in 2012 (5) and later in 2014 (1). To move closer to an industry-wide consensus, it will be essential to obtain the thoughts and inputs of all knowledgeable stakeholders (e.g., regulators, expert consultants, end users, suppliers, independent contract testing laboratories, and academic institutes). Ongoing work by ASTM’s International Committee E55 on Manufacture of Pharmaceutical Products will help, as will a new section (<661.3>) planned for the USP to cover manufacturing systems (6–8). BPSA encourages partnership and collaboration in this nascent SUS industry to include experts in the manufacture of single-use components/ systems, polymer chemistries/additives, and gamma irradiation sterilization effects. In the highly regulated pharmaceutical industry, it is essential to develop extensive knowledge of the materials involved in manufacturing, which require subject-matter expert inclusiveness. BPSA remains committed to facilitating SUS deployment. Current discussion of extractables testing must be resolved so that energy can be redirected to other topics of regulatory, commercial, and scientific importance. The BPOG Extractables Work Group’s standardized extractables protocol recommendations represent a stimulus white paper (1); a true standard is developed through efforts of recognized consensus standards-writing bodies that are open to all stakeholders, with the objective of harmonizing all proposals. For an extractable protocol, reproducible sample preparation and analytical procedures remain under evaluation. To continue to foster discussions in the SUS industry, BPSA proposes the following next steps: data sharing, piloting proposed protocols, and a taking a phased approach toward consensus. Data Sharing: It is BPSA’s opinion that before adoption of any proposal as a standard, several technical aspects should be supported by reproducible and well-supported data that are available in the public domain. To date, much discussion of extractables has been supported by confidential data. If any testing proposal is to assume a position as either a de facto or a consensus international standard, the bar is raised. So too should be the technical requirements for its adoption. If no public data are available, then each industry organization could work with its members to generate and disseminate the necessary information. Piloting Protocol Proposal(s): A fully developed proposal on a small scale should be piloted through a few end-user and supplier partnerships. Two benefits would come from this. It would answer some relevant technical questions, and it would provide further understanding of sample preparation and analytical challenges faced in executing the proposed procedure (1). Taking a Phased Approach: Organizations in the SUS industry are aligned on most objectives for standardization; however, some key technical points of concern remain in debate. The drive to industry consensus could be phased, beginning with agreement on those points that are not in debate at this time. Further consensus could be reached during a second phase as more data and knowledge are built for this nascent SUS industry. In the interim, available data already generated by SU component manufacturers and systems integrators should continue to be assessed for utility in user applications. As stated, BPSA encourages continued, collaborative dialog with all stakeholders moving forward to decide on roles, responsibilities, and timelines for turning those next-step proposals into reality. Meanwhile, BPSA itself will strive to maintain this dialog in a collaborative and productive direction through continued efforts to educate the single-use community. We will strive for consensus among the SUS supplier community, active involvement of our members in standard-setting organizations, and communication of updates and news of developments frequently throughout this process. Special thanks go to the 2015 BPSA Extractables Working Group for their diligence in drafting this comprehensive article for BPSA Member ballot and approval. 1 Ding W, et al. Standardized Extractables Testing Protocol for Single-Use Systems in Biomanufacturing. Pharmaceut. Eng. 34(6) 2014. 2 Toth RB. Standards Management: A Handbook for Profit. American National Standards Institute: Washington, DC, December 1990. 3 Extractables and Leachables Subcommittee of the Bio-Process Systems Alliance. Recommendations for Extractables and Leachables Testing, Part 1: Introduction, Regulatory Issues, and Risk Assessment. BioProcess Int. 5(11) 2007: 36–49. 4 Extractables and Leachables Subcommittee of the Bio-Process Systems Alliance. 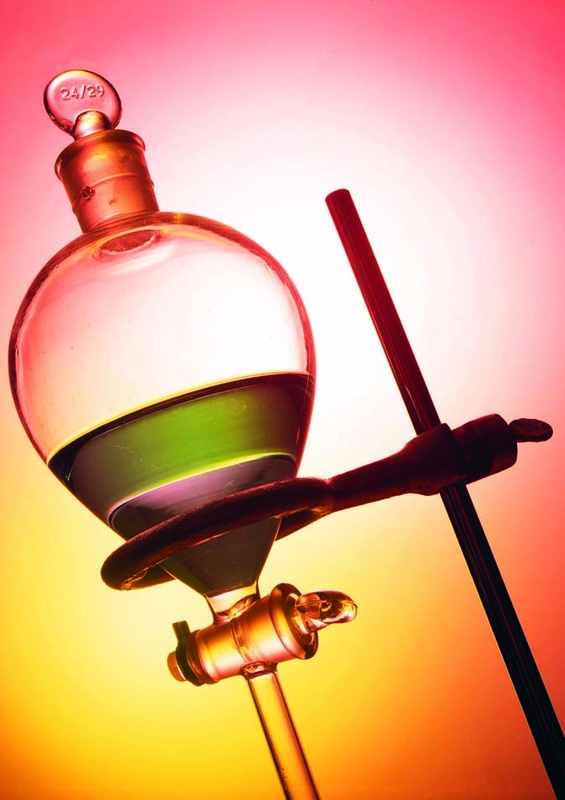 Recommendations for Extractables and Leachables Testing, Part 2: Executing a Program. BioProcess Int. 6(1) 2008: 44–53. 5 Mahajan E, et al. Standardization of Single Use Components’ Extractable Studies for Industry. Pharmaceut. Eng. 32(3) 2012. 6 Draft: <661> Containers. Pharmacop. Forum 28(2) 2001. 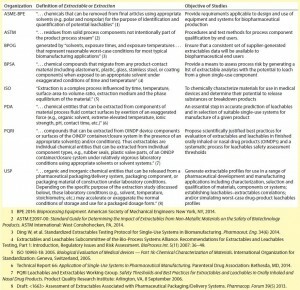 7 Draft: <1663> Assessment of Extractables Associated with Pharmaceutical Packaging/Delivery Systems. Pharmacop. Forum 39(5) 2013. For more information, contact Kevin Ott, executive director of the Bio-Process Systems Alliance, 1850 M Street NW, Suite 700, Washington, DC 20036; 1-202-721-4125, ottk@socma.com; www.bpsalliance.org.